A complete reference guide at your fingertips! "This deck is a great help for people preparing for a marketing position, as well as an excellent quick reference for people on the job in marketing and general management." 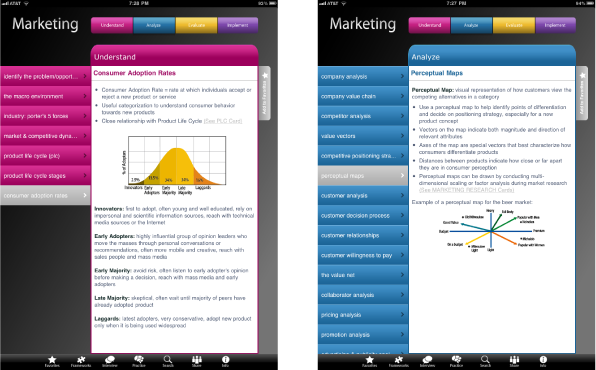 The App contains over 50 themes with cross-referencing to reinforce the links between marketing and business concepts. It is very easy to navigate and contains a series of functionalities that make marketing interview practice fun and easy! Review marketing on the bus, at lunch, in class…anywhere, anytime. Access over 50 cards with MBA content in easy “quick reference format”. Navigate deck easily and quickly via cross-referenced links. Great reference and learning tool for exams, papers and group projects. Review the interview section to ace your marketing interviews. Group your cards by subject matter or case question. Refresh on key marketing concepts and frameworks before a presentation. Review marketing concepts to prepare your marketing plan. Use practice section to flip through random cards and test your memory. 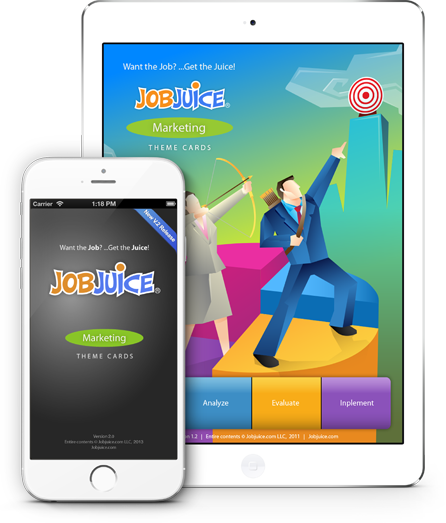 The Marketing App comes with over 55 theme cards packed with marketing concepts.